If you missed them, don't miss Beauty and the Beast: Recommended Reading Part I (which introduces these posts) and Beauty and the Beast: Recommended Reading Part II. Yesterday I recommended Beauty and the Beast: Visions and Revisions of an Old Tale by Betsy Hearne but lightly lamented that it is missing discussion of the works produced since it was published in 1989. 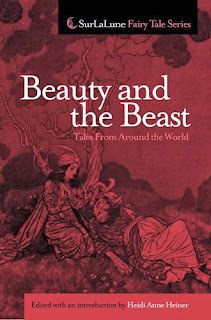 However, one book helps to fill that gap and it is one of today's recommended reads for avid Beauty and the Beast fans. That book is The Meanings of "Beauty & The Beast" A Handbook by Jerry Griswold. Using Beaumont’s classic story as a touchstone, this work shows how "Beauty and the Beast" takes on different meanings as it is analyzed by psychologists, illustrated in picture books, adapted to the screen, and rewritten by contemporary writers. The Meanings of "Beauty and the Beast" provides expert commentary on the tale and on representative critical approaches and contemporary adaptations. This book also includes a variety of original source materials and twenty-three colour illustrations. The Meanings of "Beauty and the Beast" is for any reader who wishes to explore this classic, endlessly rich fairy tale. Griswold's work explores more recent iterations of the tale, especially Disney. He discusses some of the more popular variants, as well as the tale's history, then moves on to more modern renditions. Perhaps worth the entire price of admission alone is the included reprint of "Beauty" by Tanith Lee, one of the favorite modern adaptations of the tale for many fans, including Griswold and myself. If you have never read the story, stop now, go find it in this book or in the original volume, Red as Blood or Tales from the Sisters Grimmer , which is long out of print. Lovely, lovely, lovely. My only real complaint about this book? There is no index. I would have LOVED an index in this one. But the bibliography is a great tool for reading more and includes more recent scholarship. From the Beast to the Blonde: On Fairy Tales and Their Tellers by Marina Warner is recommended on this blog all the time, although there has been a long gap. The book is out of print but readily available used. It is also a very important book for those wanting to read about women and folklore, especially fairy tales. Two chapters of the book are devoted to Beauty and the Beast type tales. Other chapters are devoted to other tales, so don't expect an entire book devoted to Beauty and the Beast itself despite what the title may imply to you. And those are the books I list in my introduction to Beauty and the Beast Tales From Around the World. My bibliography is much longer than this, but these are the books that kept me from panicking over my short introduction. I didn't need to reinvent the wheel, the work had been done for me. My job was to anthologize and bring some of the more obscure tales to light again, to collect and gather and simplify the search for many others. And I am still contemplating a second volume since I agonized over the tales that weren't included, as well as other scholarship and interpretations that are not often mentioned.